Using puzzles and games in the high school classroom is a great way to build collaboration, critical thinking, and a growth mindset. Puzzles can be particularly powerful in the ELA classroom because they allow students to approach words logically, mathematically, and visually, creating cross-brain connections. Okay, so it’s true: I love puzzles! I’m excellent at some types (jigsaw puzzles) and terrible at others (tanglement puzzles), but I love them all. And last week, I picked up a tanglement puzzle at Barnes & Noble. This is branded as Roman Arches by True Genius, but it’s traditionally known as the Double W Puzzle. I’ve worked on this thing for hours, y’all, and I only accidentally solved it once. And yet, I keep trying. And it just reinforced my belief that puzzles are amazing for developing grit and a growth mindset. I know I can solve this puzzle, and so I will keep trying. I will try new things and I won’t give up. We want the same of our students, right? 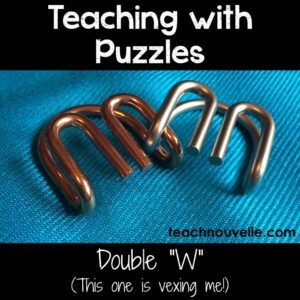 So, here are some easy ways to try teaching with puzzles and games. Using puzzles can challenge both sides of the brain. My favorite example of this is the mechanical puzzle. Mechanical puzzles are puzzles with either a tanglement/disentanglement challenge (like the one above), an assembly/disassembly challenge, a dexterity challenge, or an impossible objects challenge. They range in difficulty, and often have two aspects (take it apart/put it back together) to gameplay. I keep a box of these in my classroom. I give some to fast finishers (hint: only use wooden/bamboo puzzles for this, since the metal ones will be too noisy! ), and I reserve others for a reward day. I’ve even had luck “checking out” puzzles to students as a reward for behavior. I always have an Extra Credit Challenge for students: Check out a puzzle, solve it, and then write the solution. They must accompany their solution with illustrations or pictures. I’m also a huge fan of word games, such as Taboo® or Scattergories®. These can be great as filler games, but they can also be incorporated into your teaching, too. They make fantastic reviews. 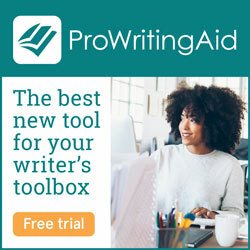 You can use the Taboo® set-up to review any list of vocabulary words, characters, or actions in a novel or short story. Simply create five words that students aren’t allowed to say when giving their clues. You can also have students create these for another team or group. For example, I split my class into groups of four or five, and have each student create five cards. Then, I have them duplicate the cards, creating two piles. Their whole group combines the cards into two duplicate sets. Then, they pass these sets to two other groups. Now, each group should have two sets of 20-25 cards, for a total of 50. Using puzzles and games can also develop collaboration. 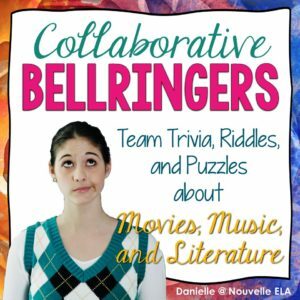 Recently, I’ve introduced Team Bellringers in my classroom. I love going to play trivia each week at a local restaurant, and they have an ongoing competition where our points add up for the whole month. Our team members are committed to coming every week because we know the group is counting on us to win the grand prize. I decided to introduce the same concept in my classroom. I created a set of twenty mini-quizzes (similar to one round of trivia) to be used as bellringers, and students split into teams of 3-4 and keep a running score over the course of a month. Each mini-quiz is focused on literature, movies, and music, and has some sort of word game twist to it. For example, one mini-quiz asks students to identify classic novels and authors based only on their initials. 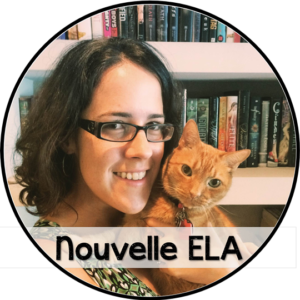 Another asks students to identify the children’s book depicted as a cake. 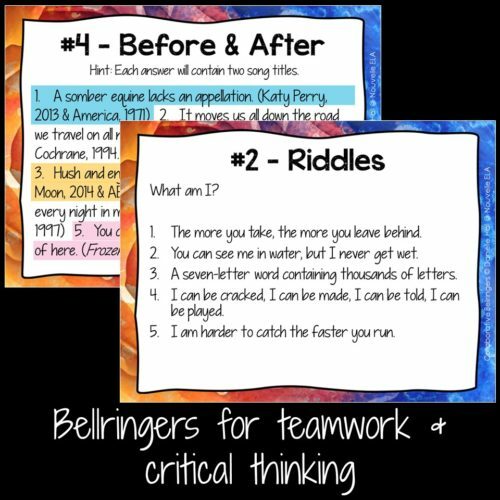 These mini-quizzes can be used as daily bellringers or exit slips, a closing activity on a Friday, or as an entire reward day. They encourage collaboration and challenge students to think critically. They are also engaging and make use of everyone’s expertise. You can grab these bellringers at my TeachersPayTeachers store. What are your favorite tips for teaching with puzzles and games? What are your favorite games to use? I’d love to hear more from you in comments! I love using puzzles and games to engage my 6th graders! Your idea to allow “early finishers” to use the puzzles and even check them out is genius! I think my students would flip for this! And any game to make vocabulary fun is a winner. Thanks for all your great ideas!